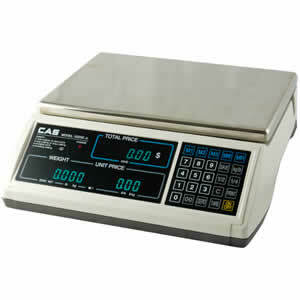 RS-130 retail scale is a popular item for weighing fruits or vegetables with price computing and NTEP approval. It includes an in-use cover for protection against spills. The unique capability of the RS-130 is its ability to calculate change and it is legal for trade in pounds, kilograms and ounces. Eight price look-ups store most popular items for speedy checkout. 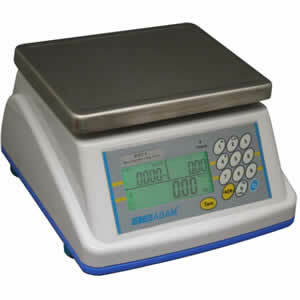 RS-130 30 lb x 0.01 lb 12" x 9.5"
RS-160 60 lb x 0.02 lb 12" x 9.5"
Adam Equipment WBZ wash down approved retail scales are ideal for food preparation, packaging plants, agricultural facilities, and other retail applications. 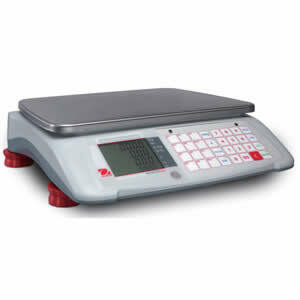 WBZ scales feature an IP65 rated wash down housing with a large stainless steel weighing pan. Larger backlit display shows weight, price per unit and an easy to read extra large total cost display. They operate with an AC adapter or rechargeable battery pack for portability; both are included. 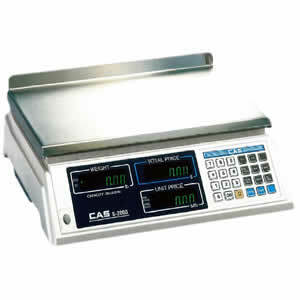 CAS S2000JR is available in a countertop design to fit into any retail weighing application that involves selling food by weight. VFD version is perfect for the deli, meat counter or candy store. Its bright display on front and rear is easy to read and the scale has indirect memory for 199 items and 3 direct memory keys for your best sellers. What makes the S2000 Junior more versatile than other price computing scales is its ability to be set up with a label printer or receipt printer. This capability is hard to find and CAS still remains affordable. Price computing on a legal for trade scale is essential in a meat market or deli and we recommend the Cas S-2000 for applications that do not require printing. 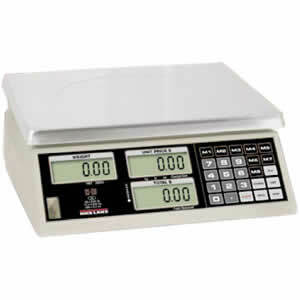 The upside with this scale is a bright VFD display, dual range capability and its high number of memory locations (999). It is an AC power only scale and cannot be connected to a printer. OHAUS’ long-term experience in engineering precise weighing instruments ensures fast customer transactions and long-lasting performance. Aviator 7000 stands for user friendly functionality and operation. The high quality of the load cell ensures long-term reliability whilst the high speed stabilization means fast signal processing and therefore fast price calculation. Four display lines - including an extra line highlighting preset tares - combined with bright backlight, ensure that the display is clear and easy to read in all conditions. One display instead of the three separate windows, more commonly found on price computing scales, gives the user a faster overview and operation. The Aviator 7000 is constructed from stamped parts with a sturdy frame plus a large, robust stainless steel weighing plate for easy weighing of larger items. The stainless steel is of high quality making it water resistant and easy to keep hygienic, vital for food safety. For even higher protection, covers are available for both the scale and the pan. The option of rechargeable NiMH or standard size D - cell commercial batteries, deliver full mobility for fast business anytime, anywhere. Aviator 7000 can be connected to an external printer or an electronic cash register. Printing tickets and reports and working with accumulated transactions are also offered as standard. 30 lb x 0.01 lb 100 9.5" x 13.3"
60 lb x 0.02 lb 100 9.5" x 13.3"